How much of that high CAPE is due to changes in GAAP accounting? "Earnings" today are pretty different than "Earnings" 30 years ago. So should I be reassured or worried if 'this time it's different'? Rhetorical question EFB, we are the adults in the room with both the temperament and wealth not to have a care in the world, but that is through experience and reasonable expectation. It's those that are on the fence about retiring at 30 or even 40 with just about 1 million that worry me a bit. This latest justification that 4% is still as solid as it was 30 years ago seems a stretch too far, but 30 years from now I'll be 73 yo and no-one's going to have a clue about what I posted on the MMM forum today. If I was right, I'll feel bad if I didn't post, that's about it. You'll be wrong. The problem that you have is that you could be right in that you are retire in a year where the 4% rule fails but the assumptions in the trinity study are going to work against your pessimism. For instance if it fails you will end up getting some social security or inherit money or go back to work because you are bored or something like that. I also have all those character based factors that you mention in spades. I just come to a different conclusion to you. The odds though are massively on my side. We should catch-up in 30 years time and see how it all turns out. That's what keeps it all interesting, even with all this data we don't really know much about the next 30 years. If I had retired early in 1987 with a 4% SWR, no one would bat an eye that it had worked out just fine. Inflation on healthcare and college might've been a challenge depending on circumstances, but people weren't retiring early and blogging back then so we don't have a lot of good data points (other than simulators and assumptions). Nowadays, it seems like everyone plans on retiring early. Doesn't help that I'm in oil & gas which is still limping through a rough downturn, but a lot of folks that were laid off are finding that riding it out isn't so bad, as long as the stock market and housing market keep going up 5 - 10% yoy. The overwhelming source of data points we are getting now are from folks that early retired during a bull market. I'm just trying to offset that a bit, I was quite stressed out in 2008/9 even though my financial situation was great (on an expat assignment, gainfully employed and making regular investments). Had I been ER, I would've definitely questioned the robustness of theories like CAPE having a new plateau vs. reverting to its historic mean. But to each their own, as you said, you are aware of all of this and arrive at a different conclusion. Well the way I look at it is this.. If the solution to a financial uncertainty is a big pile of moolah.. Then the solution to more uncertainty is "More moolah". In theory I have more than 2X the moolah required plus some (future) pension and rental income. Thus I am not worried.. much. Others have different comfort levels. My issue with amassing double what's needed is the opportunity cost in terms of time spent working to hit 2%WR and the fact that some of the possible FIRE scenarios are not mitigated by more money and are in fact exacerbated by more time working. Beyond a reasonable point [to me ~4%WR] I see money as being the primary risk to FIRE success. Your're absolutely right and my reply was unintentionally flippant. I did not intend this to be read as a strategy, just that in our case our liquid networth has more than doubled since my first attempt at retirement 3.5 years ago (partly because I had forgotten that my UK pension might have some value.. It actually has quite a lot of value, our WR was $zero during that time and the fact the market has done pretty well). So I ended up with more than 2X of what is required by accident pretty much. Now it could have gone the other way and we might have been tightening our belt at this point just as easily... Sequence of return risk. But you're right, if I had been working into my 60's and suddenly got cancer like my buddy did (he is almost grasping at straws at this point) then clearly such a strategy would have been a very bad idea. I like this down to earth humble pie conversation. I don't understand this. Are you stating that too much money leads to less chance of fire success. I'd rather have too much compared to too little. Are you stating that working too long leads to more of an obsession with work which could impact your life post retirement. What I am saying is having the money you planned to spend each year in FIRE is only one element to being successful at retiring. There are lots of ways you can fail at FIRE that don't involve running out of money. Not only are these ^^^ types of issues not mitigated by a low WR, but if you work extra years you are likely to exacerbate them. People focus on money because it's easy to calculate, spreadsheet and there is a lot of fear in our society around money, but it's far from the most important risk FIRE success. I'd put your health and time ahead of money if I was prioritizing FIRE risks, but that's not what I read about on MMM much. Awesome chart thanks to Maizeman. It always helps me put things in perspective. Retire-Canada - I get your point. I think the more money that you have should increase your chances of financial success in relation to RE. The issue is that there are so many other factors that lead to a successful life which should include retirement. I'm not sure if working longer will necessarily make those other factors easier or harder to achieve. Some people have to work to be happy. My mum is in her early 70's and can't help herself. She just loves to work. Dad is retired and is happy for her to keep working so that he gets some peace. I do understand where you are coming from though. Your health and your relationships are easily just as important as your finances. This may get a little philosphical, but I wrote a post on my (now defunct) blog about how someone with 1M might be better prepared for a sharp downturn (50% market decline) than someone with 2M, if both are using a 4% SWR. Some of the reasoning was that the 1M are watching closely and more prepared to tighten the belt. The 2M folks see a greater numerical decline, are paying more tax at the higher WR, and may feel that cutting back is less palatable (especially if they have higher fixed costs). Now that I have seen the 1M and 2M+ persons recover, I don't think that my premise was entirely right, especially as I saw those with higher net worth come back after 2008/9. Fixed costs can be managed and belt tightening is the same if not easier. Sure, they may groan a bit about having to keep the car an extra year before trading up, but having more money at the outset seems to give you more options to optimize during the recovery. I'm moving an opinion here in hopes that people will weigh in on it. I have two concerns here. 1. My first concern about the beloved 4% rule is that it may be inadequate if people retire now while stocks are expensively valued. The authors basically said, oh you have 20 years to eat away at your retirement? We'll look at as many 20-yr consecutive time periods as we can in our study and see how things fared. However, they don't account for the possibility that the market starts out very expensive and that subsequent years could perform poorly. Also, the study is also nearly 20 years old. Modern CAPE research says, what is the long-term returns 10-15 years from now given we are starting at a specific CAPE ratio? Historicaily a CAPE ratio of <10 should has an expected return of 11.7% going forward while a CAPE ratio of 30+ has an expected return of 0.5%. This research is 18 months old, and it explicitly recognizes some CAPE shortcomings and attempts to address them or adjust for them. If you read the newer study, I just think we should be skeptical of the 4% rule given that we are in an expensive market and proceed cautiously. With valuations at a relative historical high, it's more likely that the returns assumed in the 4% study will not be achieved. 2. My other concern is that the 4% rule is a bit overpromoted and that we should find other research to supplement it. Like the link that is attached. My concern is that clinging to a single ideology brings similar dangers to not having a diversified investment portfolio - if you adhere to one strategy that doesn't work out, it could hurt your retirement. Thread titles like "Stop worrying about the 4% rule" don't really help. I think they were saying that, suppose you think you need $X for retirement. That $X makes all sorts of potentially flawed assumptions like, future investment returns will allow the 4% withdrawal rate to work, I won't have something devastating and costly happen,etc. It probably makes sense to have a margin of safety. Maybe $1.1X or $1.25X. $2X is probably going overboard though. No adding extra $$ to say a 4%WR as a safety margin was totally not what I was saying. The last couple posts between Steveo and I capture what I was getting at pretty well. So like I said in a previous post - just save up 30x expenses instead of 25x expenses, if you are worried that 4% is not enough. The original trinity study and the modern studies that have replicated and expanded on its results used 30 year intervals, not 20 year intervals. That's an important distinction because making 25 years of living expenses (the retirement stash suggested by the 4% rule) last 20 years would mean you could afford to actually lose money on your investments and make it to the end. A 30 year interval requires you at least earn a positive return. You also have mentioned in multiple threads about the trinity study being nearly 20 years old. That'd be a valid point if it was one paper that was never replicated or iterated upon. Instead, you'll see that there are dozens if not hundreds of follow up studies that have tested different sets of assumptions and investment strategies and spending strategies. Finally with regards to using historical data to test the success of investment strategies you say: "However, they don't account for the possibility that the market starts out very expensive and that subsequent years could perform poorly." Is it your position that there are no historical time points where the stock market started out extremely overvalued and performed poorly for years? Those are the predicted average returns, but what is the variance around those estimates? Within the range of historical returns on investment, variance and sequence of return has a much bigger impact on sustainable withdrawal rates than the overall CAGR of the time frame. Also, you're falling into a bit of a fallacy by trying to correlate the comparative recentness or antiquity of an idea with accuracy. For example I'm writing this reply on a computer that was designed based on a model of electricity which is literally centuries old. Recently published papers have described a reaction-less form of propulsion, which, if it proves to really exist,* could open up the stars to humanity. Guess which of those idea I have more confidence in right now. *Google em drive. I'm not holding by breath though. Not to mention that using something like CAPE to try to time the market is, well, trying to time the market. We all know how that goes (badly). Actually, the original study and the 2009 update both report results based on 15, 20, 25, and 30-yr time horizons. So why aren't we referencing them as well? No, my position is that if retirement begins with stocks overvalued, it is faulty to assume that future 15-30 yr investment returns will follow historical experience. This position to supported not only by the CAPE link but also in Ben Stein's interesting book "Yes You Can Time the Market". Yes, the returns are predicted based on a formula, but based on a structire with intuitive appeal. Although variance numbers are not provided, they do provide minimum, 25th percentile, 75th percentile, and maximum returns. If you wanted to try mixing both studies, in this CAPE 30 environment, you might try simulating a portfolio which experiences a 0.5% return for 10 years and then returns to normal and see how that might change the simulation. Also, you're falling into a bit of a fallacy by trying to correlate the comparative recentness or antiquity of an idea with accuracy. In this case, I don't see any fallacy. I think the study remains useful and insightful but can be very much improved upon when the assumptions regarding investment returns are updated with modern information. I have done actuarial work and spreadsheets since 1996. Even though there was innovation going on in 1996, the world did not implement credit scoring to insurance, decided it had a better model, and stopped improving it. There have been been many more changes in first 20 years of my career, and I am reluctant to take 20-yr research at face value without considering how much better than study could look today. Star Research took the idea of CAPE (assuming that 1988 article actually refers to CAPE) and was able to show that there is a relationship between CAPE and future investment returns across the globe, giving further credence to an idea that was good in the first place. The whole point is you don't know this. Nobody knows what the next 10-15 years of investment returns will be for today's CAPE 30 scenario. But historically about 35-40% of the time the return was negative for the next decade and 75% of the time it was no better than 3%. The whole point is neither do you. People have been saying CAPE was high for at least the last 3 years, maybe longer. Ask those people that sat on cash because of high CAPE how much money they lost out on because they tried to use CAPE to time the market. As I've been saying, if high CAPE bothers you, AND you're retiring within the next few years, just save up a bit more. I think the insight you're missing from the Trinity study (and successors) is that over the past 100 years the market has been overvalued before, and has experienced periods of slow to negative growth before. Even given the worst market returns in recorded history, 4% was a low enough withdrawal rate to make it through. In average to good times, 4% was excessively conservative and someone following that plan would die filthy rich. If you wish to cast doubt on the validity of a 4% SWR, it's not sufficient to claim that stocks are overvalued and that you expect returns to be lower than their historical averages. All that has happened before, and 4% was just fine during those times. Instead you need to show that the next 30 years will be historically bad, the worst ever. That's certainly possible! That said, I don't think that a high CAPE ratio is sufficient evidence that this is likely to be the case. I'm not advocating sitting in cash. The are plenty of lower-CAPE options out there. Talking about a single anecdote between 2014-2017 doesn't prove anything anyway, there are always counter-arguments. Imagine how much richer you would be had you sold off at the CAPE of 44 at the dot-com bust, or the CAPE of 27 before the financial crisis and bought back in at CAPES of 23 and 15 respectively. Exactly. The 4%WR plan is thrown around so commonly we lose sight of how damn conservative the assumptions are that are baked into it. Including poor sequence of risk, high inflation, world wars and numerous financial meltdowns. Not to mention robotic fixed inflation adjusted withdrawals vs. adjusting spending to market performance. Never earning another penny. No government retirement benefits. runewell, as you indicate there is a high likelihood of negative returns in the future since the CAPE is over 30. Are you using your information to short the market or buy puts and take advantage of this bet while the odds are in your favor? Yes, you're right. The study also looked at shorter time horizons. Still omitting the longest interval studied (30 years) and claiming the study looked at 20 year intervals as a bit misleading no? And my position is that if stocks are within the range of valuations observed in the past (which they are), then it is more likely that investment returns over the next 30 years will fall within the range of valuations observed in the past than outside of that range. The idea of historical backtesting is to measure the distribution of outcomes not simply to estimate a mean (if it was, everyone would be talking about the 6.8% rule). I think you'll find very few discussions on this forum reference the original Cooley, Hubbard and Walz paper directly, (rather the general body of work that's developed around the concept of safe withdrawal rates defined using historical backtesting). For example, that original Cooley at al paper takes a much more favorable view of bonds than pretty much anyone in the FIRE community argues for today. If you're concerned about US equity CAPE then make sure to diversify into international. A Japanese investor would have seen his investments improved if he diversified out of his country's equity markets that were devastated in the early 1990's and have never fully recovered. Diversify your CAPE by diversifying equity exposure. I think the insight you're missing from the Trinity study (and successors) is that over the past 100 years the market has been overvalued before, and has experienced periods of slow to negative growth before. Even given the worst market returns in recorded history, 4% was a low enough withdrawal rate to make it through. No, the 4% test failed for 20+ years during a 1929 start. I know you're going to tell me that I'm grasping at straws picking the year of the great depression, but the author not only pointed out this instance but went to all the trouble to do a second chart showing everything after WW2. The great depression was a CAPE of 30 and caused turmoil. Now I'm going to be point out the obvious and note that the CAPE ratios were closer to 15 +/- 5 back then and noticeably higher since 1990. The update to the trinity study says that even in light of the financial crises the 4% rule was OK. There's just one problem with that, a 15+ year time frame using 2000 as the start has yet to be accounted for. If the study is performed again ten years from now, there isn't going to be a spotless record because those people who retired at a CAPE of 44 with lots of stock exposure were about to get a big shock. A quick survey of the chart suggests that the 12-pt drop in the CAPE during the financial crisis is the third worst drop ever. Well the CAPE is perched at 30 again. You can call me chicken little if you want for emphasizing the low points in our stock market's history. I just want you to know that there a lot of reasons why we should be cautious where we are now. This is only the third time the CAPE has been this high for the S&P, and the last two did not end well for the investor. Exactly how is this strategy going to help when the expected return is a low negative or low positive? This is exactly market timing. We're at 30 now, so should we sell right this moment because we're above the 27 it was at before the financial crash? Or should we wait and sell later, because it's no where near the 44 of the dot-com bust? By definition this is more risk. Anytime you try to pick winners, you might be right, but you are definitely engaging in higher risk than VTSAX that tracks the whole market. Essentially, your solution to the 4% rule (which is very low risk) is to engage in more risk in hopes of beating the market. Well, that might work for you and it might not. But don't pretend that what your doing is less risky than VTSAX. It's not. It's actually more risky. I picked 20 because it was in the middle of the range, and hopefully to demonstrate that there are results for different time horizons. But my point was only to talk about what the study measured. But there are only two years that have ever had CAPE ratios as high as today (1929 and 2000). 1929 failed the 20+ year test and 2000 probably will when it can finally register as a starting point. So isn't your generalization above very misleading? Thanks. I feel like I have generated a surprising amount of subtle hostility just for suggesting some enhancements to the 4% rule. I'm sorry if I come across as a know-it-all, i assure you that is not the case. Do you guys really not like the idea? Do you think it is ridiculous and without merit? I know it might only apply once every 40 years but if that's the case there's a 75% it will surface in a 30-yr time horizon.... I suspect after so many good years in the stock market nobody wants to imagine it reversing course? Thanks that is exactly what I plan to do! I am about 75% US, 20% International and I am going to drop that to about 55/40 in the coming week. Yes, I guess you are right, we don't really talk enough about diversification. I'm 80-20 Stocks/Bonds, but within stocks I'm about 65/35 US/International. Those are smart things to do, IMHO. I think you should stick with a % of international exposure right from the beginning rather than using CAPE to decide your international exposure, otherwise you're just essentially doing market timing. CAPE could actually go down in the US just because profits of S&P 500 could go higher than the market price. You make assumptions about the future that may turn out wrong. Best to get out of the crystal ball/prediction business. If you learn new things about why international exposure should be higher %wise then I think that's a different issue. For example, you might read that international represents approx. 45% of the global stock market. I'm just reallocating my portfolio to equities that are not so overpriced. By definition this is more risk. Anytime you try to pick winners, you might be right, but you are definitely engaging in higher risk than VTSAX that tracks the whole market. Essentially, your solution to the 4% rule (which is very low risk) is to engage in more risk in hopes of beating the market. Well, that might work for you and it might not. But don't pretend that what your doing is less risky than VTSAX. It's not. It's actually more risky. I disagree. Proper asset allocation considers both expected value and variance of portfolio returns. I would still own ETFs containing thousands of stocks for proper diversification because I want to lower the variance of my return. But, I still want to get a good return. I would much rather hold a low-CAPE ETF that will generate a return of 8.7% and a standard deviation of 12% rather than a high-CAPE ETF that will generate a 0.5% return with a standard deviation of 10%. Simulate a 10-yr average of those two distributions and the low-CAPE scenario will run circles around the high-CAPE scenario. 1) People pop up talking about how the 4% rule is broken and doesn't apply ALL THE TIME. That's why this thread exists in the first place. Way way back in the day, it used to be about half the threads on the Investor Alley subforum were devoted to this topic. 2) The dangers of overfitting models. The overall historical record for the stock market just isn't that long as statistical datasets go. It wouldn't take putting too many factors into a model to predict historical data perfectly but aren't useful at all to predict future returns. Without doing cross validation it's very easy to end up very confident and very wrong at the same time. 3) In your posts so far you've kind of waved aside the expertise already present on the forum regarding CAPE ratios and the (very legitimate I think) issues those folks brought up with the changes in how earnings must legally be reported and how this means a CAPE of 20 today doesn't reflect the same underlying ratio of business productivity to stock price as it would have in 1965. Yes I know this. Meb Faber (good site) often talks about how countries have home-country bias when it comes to investing. As for the whole market timing - you have to make some assumptions. Why are we investing at all? Because we want to get a good return? What assurance do we have of that? None really, we just look back at the past and usually there has been money to be made. Why are different asset allocations promulgated for different ages? Because risk tolerance changes. Why shouldn't it stand to reason that there are metrics that like P/E or CAPE or P/B that can improve our investment choices without ending up in left field. has only been meaningful at long horizons and, even then, P/E ratios have “explained”only about 40% of the time variation in net-of-inflation returns. Our results are similar whether or not trailing earnings are smoothed or cyclically adjusted (as is done in Robert Shiller’s popular P/E10 ratio). It might also be informative to compare the way you're presenting your argument to the way gerardc presenting his or her position in the other thread you're using to discuss your new study. He or she also came forward and said basically "hey guys, here's an error in the assumptions used for trinity-style studies that may make the results a bit too optimistic" and received a very positive response from the community rather than sustained pushback. Fair enough. A portion of my time at work is trying to fit new variables to insurance pricing models so I am very interested in all of this. even then, P/E ratios have “explained”only about 40% of the time variation in net-of-inflation returns. You're making investing decisions on indicators that are only right about 40% of the time? Holy crap! I'm just watching this conversation mostly from the sidelines but I started a train of thought based on the above and it led me in a pretty strange place, so I thought I'd share it with you and ask you to help me understand where I've gone wrong. I'll take your data at face value that the CAPE is at 30, and that is historically very high. 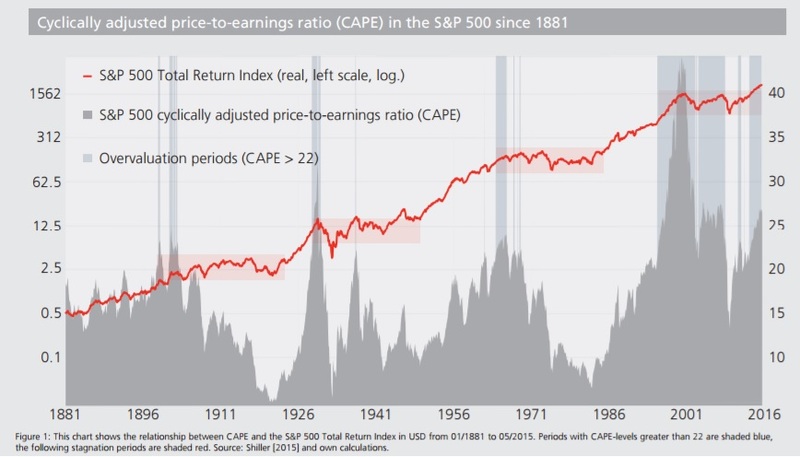 I understand that the CAPE ratio is based on the current price divided by the previous 10 years of earnings. My understanding from the Nightly Business Report is that the current PE, which I'm assuming is price/TTM, is just somewhat higher than the historical average. I think the average is 16.something, and we're at 18, more or less. And this has been the case for about the last six months to a year. Reading between the lines, the CAPE has been rising lately, and this concerns you based on what it "predicts" for future returns. If the CAPE has been rising recently but the current PE's have been historically average, the only reason I can imagine that to be the case is that the rolling 10-year window of CAPE is having some lower-than-average PE ratios drop out of the data set. That is to say, the PE's in 2006 were something pretty low (like maybe 10, just a SWAG) and they were keeping CAPE low in 2016, but now that we're in 2017, those low PE's from 2006 are being replaced by the approximately average PE ratios of 2017, which is causing CAPE to rise. If all that is correct so far, even if the CAPE data predicts it, I'm having a little bit of trouble understanding the proposed mechanism by which a recession in 2007-2009 predicts lower than average earnings in 2017-2037. In other words, my suspicion is that it is data-fitting rather than an economic theory - the same as the price of butter in Bangladesh or skirt lengths or who wins the Super Bowl. I'd really appreciate your (or anyone else's) thoughts or clarifications. First of all, that's not what it means. Second of all, it's "40% more" information than you have. OK, then explain what it means. To me it looks like high CAPE is correlated with high returns and low CAPE is correlated with low returns. If this is true, you shouldn't get out when CAPE is increasing. You should ride it as long as possible because that's where your gains are. On the other hand, when should one get off and move $$ elsewhere? That's impossible to predict. We might tap out at CAPE 30, or we might to to CAPE 44, or even higher. That's what it means when we say the future is not really predictable. Which is why you invest in VTSAX and don't ever sell. If you are in the accumulation phase, keep buying, even during dips. Make sure you have some bonds, they act like dry powder during stock dips. Diversify with international stocks (I do). These 2 things are hedges against 100% VTSAX and I think they are smart given volatility is inevitable with stocks. If you are retiring in the next 3 to 5 years, then maybe CAPE has more value. I'm not, so I'll keep buying, every month, regardless. I'm also saving up 30x expenses and will have a paid off home before pulling the plug. My yearly budget will also have at least $10 to $20k that I could easily cut without any issues. Again, more hedges. But then again, I'm really very conservative when it comes to this stuff. That makes sense. The great thing about insurance datasets (health, auto, life, or other) is that you likely have access to 100k's of largely independent datapoints to test the correlation between a given potential explanatory variable or combination of variables and outcomes (car crashes, premature deaths, what have you). That gives plenty of data to subdivide, use a portion of your data to develop a model and another portion to validate the model. The thing you've got to remember with historical stock market data we have only ~150 years of data and the data is autocorrelated (bad years are more likely like come before or after each other expected than by chance alone, and good years also tend to cluster). This is why monte carlo stock market simulations tend to produce more optimistic outcomes than historical backtesting. 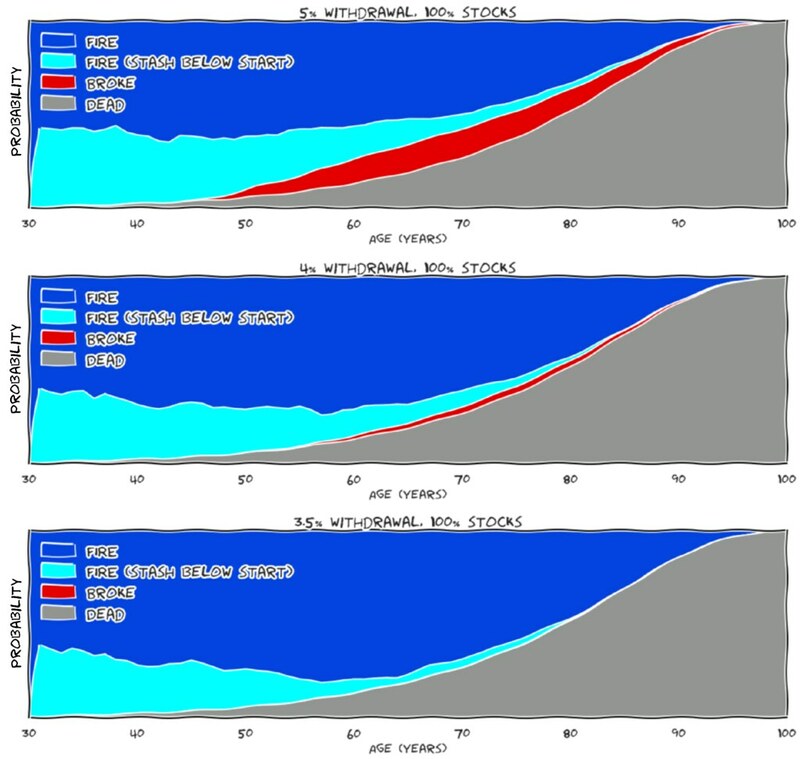 It also means that it's much much easier to develop overfit models than the types of data you're used to working with. Have a look at this graph. During this 5-yr period of 30+ CAPE ratios the 15-yr investment return was pathetic. I remember the dot-com boom and bust, for a while stocks went up and up, but at ridiculous valuations and eventually everything came crashing down again. Money kept going into the 401k, but the 401k didn't seem to go up for awhile. Personally I don't think our CAPE 30 situation today is nearly as dangerous. But the historical returns for 30+ CAPE investments are so bad that I am ready to tilt my portfolio to more international. The UK only has a CAPE ratio of 15. China is 15, Australia is 17. That's where my money is going. I know you had more to say (why the ginormous gap between CAPE and forward P/E?) That I do not know right now, not sure I will even find out. It is possible to download a spreadsheet with Robert Shiller's calculations, I did that once. That might be a good place to start. He doesn't do other countries though like this Star Research site. If the CAPE has been rising recently but the current PE's have been historically average, the only reason I can imagine that to be the case is that the rolling 10-year window of CAPE is having some lower-than-average PE ratios drop out of the data set. Another thing that can cause this is rapid growth in the absolute value of corporate earnings. If corporate earnings are growing quickly (as they have since 2009) and the PE ratio stays the same, that means the overall valuation of the stock market also increases rapidly. However, because the PE10/CAPE looks back at earnings over the last decade the 10 year average earnings lag behind current year earnings, so the P10/CAPE can increase at the same time. No, the 4% test failed for 20+ years during a 1929 start. I think this statement proves that you do not understand this topic very well. Perhaps you expressed your true intentions poorly, but as written that sentence is clearly false.